Cooking with Amy: A Food Blog: Let’s Talk Hanukkah (or Chanukah) & Giveaway! Let’s Talk Hanukkah (or Chanukah) & Giveaway! Hanukkah is known as the festival of lights, it’s a holiday celebrated for eight nights, and like so many other holidays, it celebrates the perseverance of the Jewish people in the face of adversity. The reason the holiday is for eight nights, is because oil for an oil lamp for use in the temple that was supposed to last only one day, lasted a full eight days. Miraculously this was the time needed to replenish the supply. In truth, it's a holiday that gets very little attention. Christmas is a big deal holiday. Hanukkah however takes on inflated importance because of its proximity to Christmas. This year it will be celebrated from December 16 through December 24th. But other than spinning a top called a dreidl, lighting candles to commemorate the miracle and eating potato pancakes or latkes which are fried in oil, there’s not much more to it. When it comes to food, there are no advent calendars filled with toys or chocolate, just cheap chocolate coins. There is no buche de Noel, no fancy holiday cookies, no gingerbread houses. In Israel they celebrate by eating jelly donuts called sufganiyot, but I've never seen them let alone tasted them. While some gourmet retailers have put together gift baskets, I’ve never found any I thought were very good. Most of them are actually pretty pathetic, they often include items from other Jewish holidays, as if no one would notice. Traditional Purim cookies called Hamantaschen in a Hanukkah basket? It’s the equivalent of offering up chocolate Easter eggs for Christmas. No bueno. 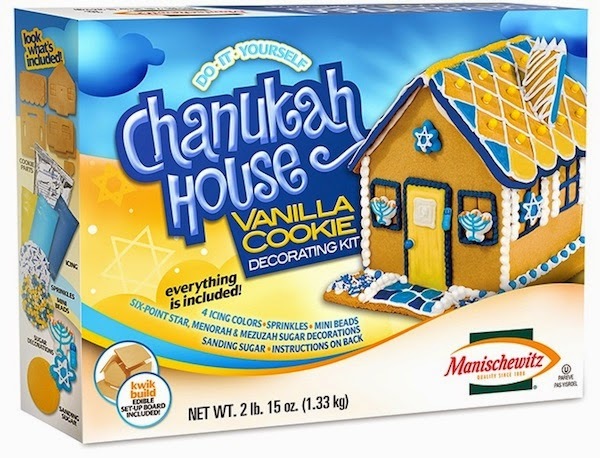 But thanks to Manischewitz there is a Chanukah House! For kids this is a fun way to celebrate and get in the holiday spirit. The kit comes with cookie house panels and plenty of frosting, sprinkles, mini beads, sanding sugar and little medallions for decorating. There is a contest launching today, December 9, 2014 with $3500 in cash prizes for the best houses. I’m giving away one Chanukah House Decorating Kit! In order to be considered to win the Chanukah House Decorating Kit (valued at $17.99), please leave a comment telling me how you celebrate Chanukah or any creative ideas you have for decorating the house. You must have a US mailing address to win, and you must include your email in the appropriate field when you leave a comment (your email will only be visible to me). One entry per person. I will choose a winner at random, this Thursday, December 11, 2014. Disclaimer: My thanks to Manischewitz for hosting this giveaway, I was not monetarily compensated for this or any other post.